This magnificent three piece garniture has been expertly crafted, with exceptional attention to detail, and features charming scenes of 18th Century courtship. This beautiful garniture consists of a central vase, which is flanked by two taller vases with lids. The set is stylistically uniform, crafted in the Sèvres style. 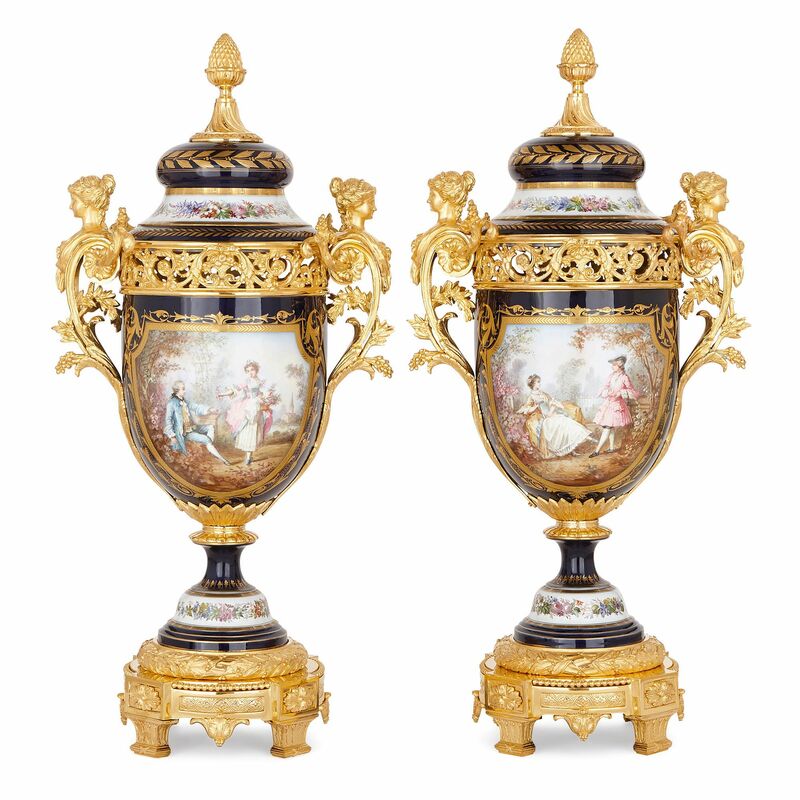 The vases stand on circular ormolu plinths, which each rest on four fluted stile feet. The plinths are highly ornamented, with winding, foliate friezes, acanthus leaf mounts, and beading along their edges. 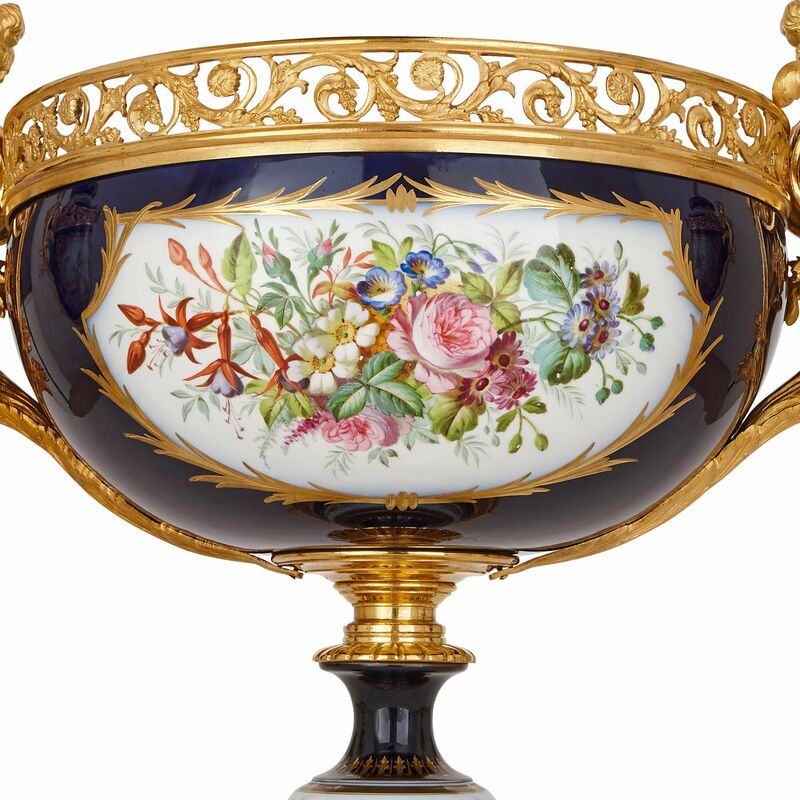 The vase feet are encircled by an ormolu band, which takes the form of a laurel wreath, wrapped in ribbon. Above, the porcelain vase feet have been painted with bands of colourful floral swags, set against a white background. Gilt borders enclose the decorative band, and stylised, gilt paintings of leaves decorate its top. 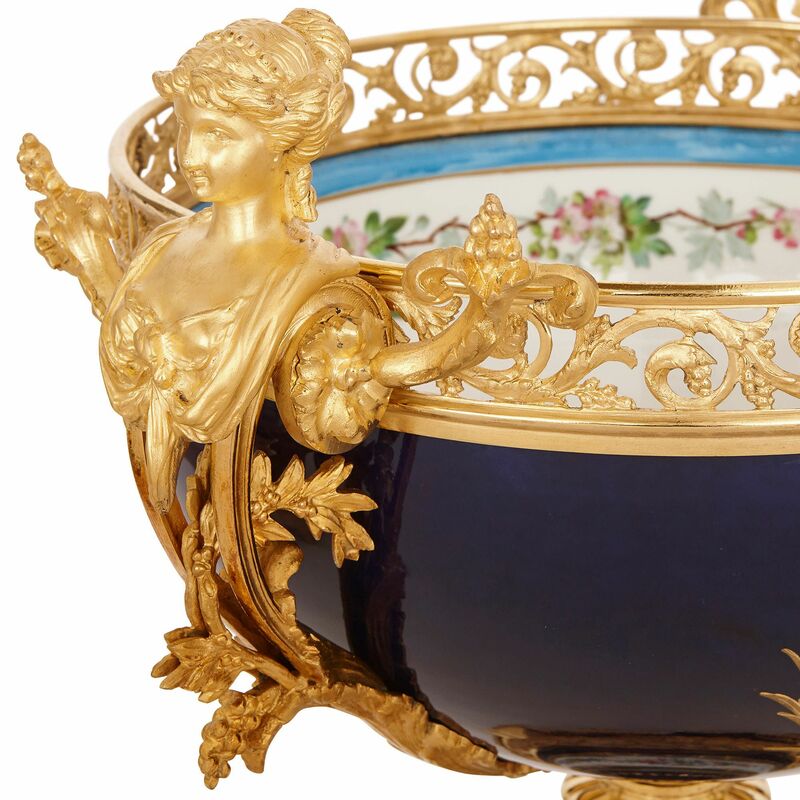 The rest of the foot is painted a deep navy blue colour, typical of Sèvres style porcelain. 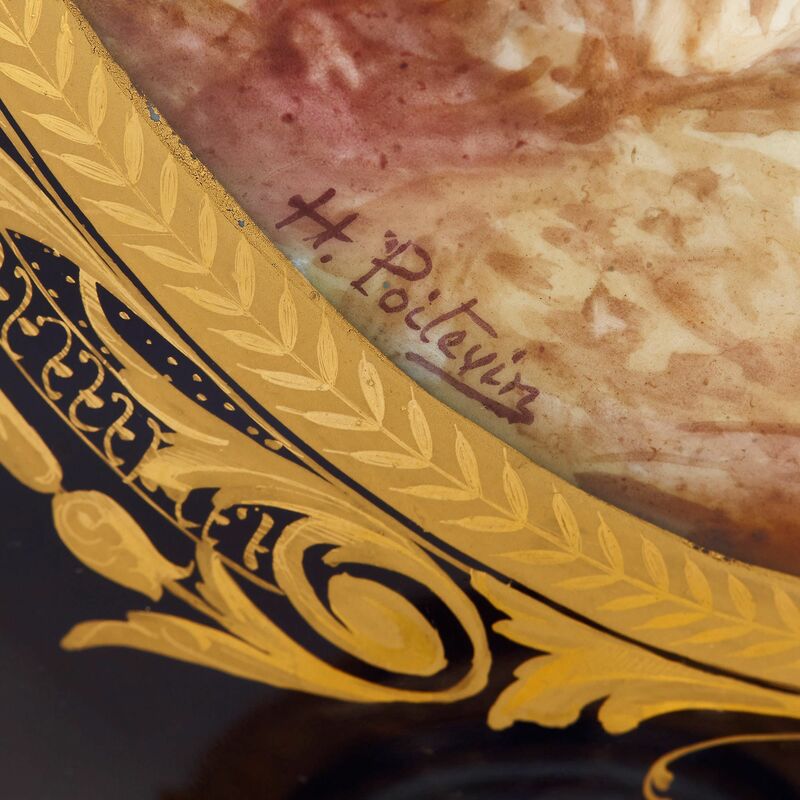 Ormolu mounts — cast, for the two taller vases, as leaf forms, and banded for the wider central vase — have been fixed to the top of the feet, to support the vase bowls above. The bowl of the central vase is wide and shallow, and painted with a figurative scene at its centre. This scene depicts three figures, dressed in 18th Century style clothing. A young man and woman sit side by side at the centre, and a second woman accompanies them. It is likely the couple are courting — the man places his left hand on his heart, and the woman looks at him affectionately — while the woman on the right may be the central woman's chaperone, lady's maid or close friend. The scene is set in a beautiful garden, full of flowers. The two flanking vases have more slender, taller bowls. These are similarly painted with scenes of 18th Century courtship. In one, a woman hands a seated man a flower, and in the other, a man and woman face one another, the man standing before the woman who is seated. Like the central vase, these scenes are set within gardens, burgeoning with flowers. The three paintings are signed 'H. Poitevin', and are enclosed within scrolling, foliate gilt borders. 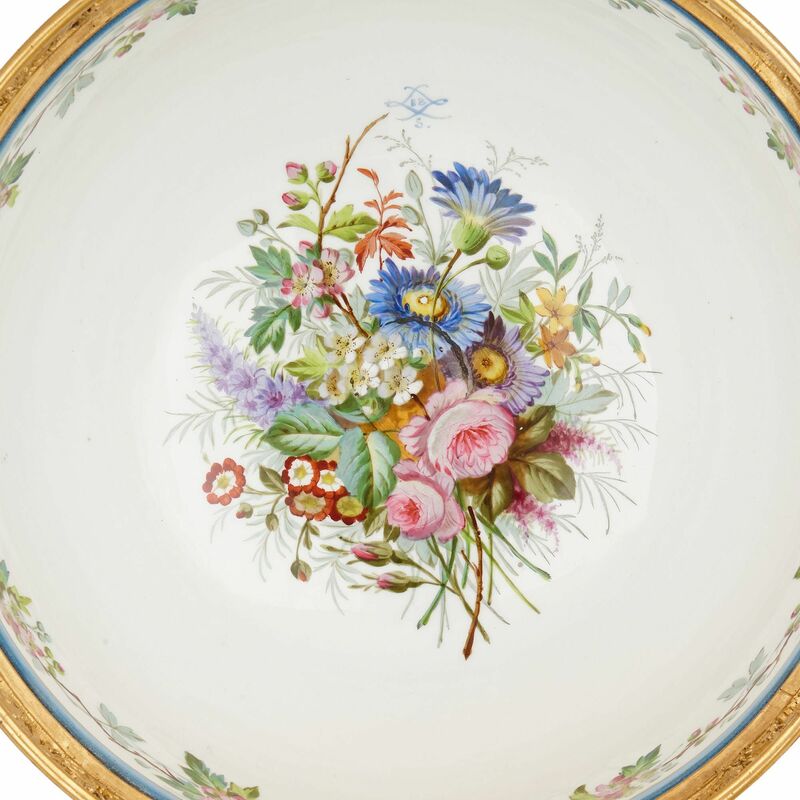 The backs of all three bowls are decorated with clusters of colourful flowers, painted against white grounds. Each of the three vases is fitted with a pair of ormolu handles, which take the form of scrolling vines, mounted with classically-inspired female busts. 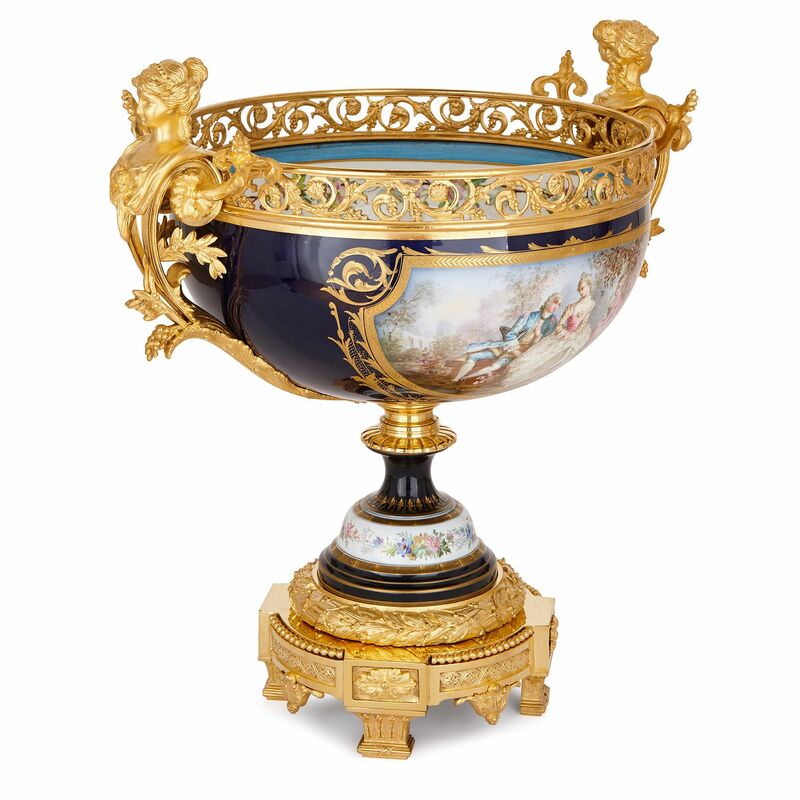 The vase bowls are topped by a ormolu frieze, pierced with scrolling vine patterns. The interior of the central, wide vase bowl is painted with a colourful bouquet of flowers, ringed by a floral vine and blue-painted rim. 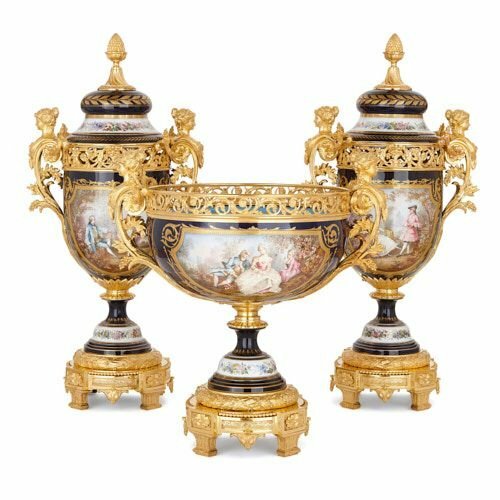 The two flanking vases are fitted with porcelain lids, which are decorated in a similar way to the bases, with white floral bands, rings of gilding and gilt leaf patterns, all set against a deep blue ground. The lids are surmounted by large pinecone finials, which act as handles. 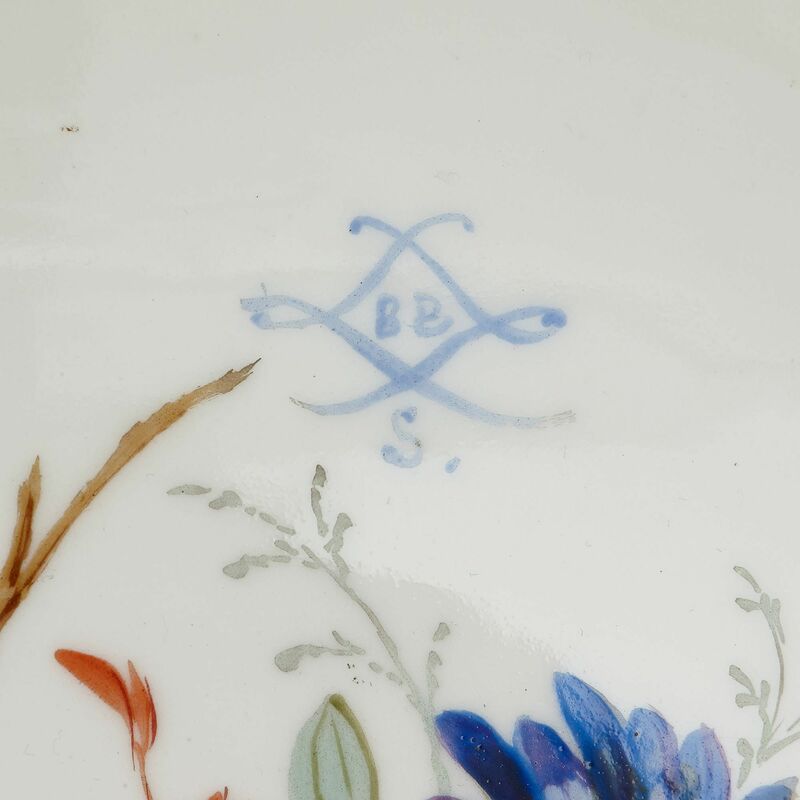 The three vases are marked with blue-painted interlaced 'L's, enclosing a 'BB' and with an 'S' below. From the collection of the Saint Louis Art Museum.